On 10 July, Grandmaster Evgeny Sveshnikov, always one of the most interesting and outspoken of chessplayers, gave a live and exclusive interview to Chess-News. The full audio and text, in Russian, can be found here, but below we present an extract in English, with some of the most interesting points made by the veteran theoretician and GM. E.SVESHNIKOV: What am I as a player - Russian or Latvian? 19:12 in favour of Russia. This is how many championships I have played in the two countries. I had been preparing for the match against Karpov since December. My son helped me, and it is a long time since I was so well-prepared for a match. Scandinavian, Caro-Kann, 1...e5 - for white, we prepared a lot of things. In addition, I had to prepare very seriously in the Anti-Meran. And in the end it all went down the drain! He did not play anything I expected. The Sicilian was one thing I could never have expected from him, because in the Sicilian, I still play a lot of options. Nevertheless, he went for the Sicilian Defense. Not one player in the world has such match experience as Karpov. Even Kasparov does not have so much experience. ... I think he thought that he would win the match easily, then suddenly there was a struggle. I told Tolya at breakfast: it seems to me that I am not like everyone else. I was beaten and yet I felt stronger. That is, I have more confidence after a defeat than after a victory. I remember the fights with the creative chess players with whom I played a lot - say, Volodya Tukmakov. I lost one game, and then a second in the same opening. But the battle was equal, I had a good position, but I lost. But then I won the third game, and this was the best game of the tournament. And the variation was "closed." That's it! You see, I have this approach: I always dig deeper at one point and find the truth. If I'm in the right, I'll prove it. ... I once beat Victor Lvovich for the first time in my life! And the first time I got a really worse position as Black, defended well and won! It was in 2007 in Chelyabinsk. And I expected from Victor L. that he would attack me for this victory. And so it was! I sat there, he lambasted me and I smiled. It was funny. I always ask Korchnoi not to change, because this is his essence, and for that we love him. He - Korchnoi, he does not need to change and adapt. But Tolya has no such problem, he knows how to lose. But Victor L., and I think Kasparov, they are not able to take defeat, they have not learned. Well, what of it? I critically look at the computer Houdini, who is a trainer for all. I look at its assessments and evaluations and think they are simply awful! As they say, one's ears burn when one looks at these evaluations! Both in the opening and the endgame too. And after combinations. I can cite hundreds of examples where the assessment is completely wrong, just absolutely! Well, in the opening on the first moves, the computer does not understand anything. Even on the fifth, tenth move, there are a lot of errors. And all the young people think that the computer is infallible. This is not true. Garry [Kasparov] owes it to me to play me at classical chess. And I look forward to when he will give me a chance. Here in Riga, it can be arranged. He also owes Shirov a match. 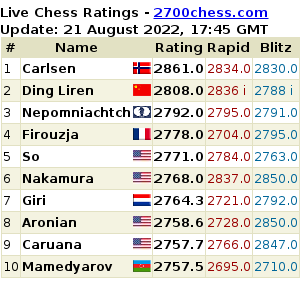 I believe Garry broke Shirov's chess fate. That's all I can say. You know, you become world champion when you are given a chance at your peak. And if this chance is taken from you by fate or someone else, you do not become world champion. But there were people who could become champions. For example, Rubinstein. Well, I will not name all. And Nimzowitsch had a chance. Maybe he would not have won, but he had a chance. He just could not raise $10,000 for the purse. It was not fate that stopped Korchnoi becoming champion, it was the fact that he ran up against Karpov. I think Tolya will not mind me saying so, but I think that the match in Baguio was not quite fair, and I told Tolya this. Not because there was any fix or anything, but because the two players had such different seconds. Tolya had many people working for him. But that's life. It is not Tolya's fault. Fate was just not kind to Viktor Lvovich. Kasparov knows that he owes me a match, I remind him about it constantly. Before writing my next book I would love to play with him! Instead of one classical game, we could play four rapid ones. And if he wants to talk about politics - I am also happy to break his position there too! Because I always hoped that the Russian authorities will treat his political statements with a smile. But it seems that he has gone too far. I have spoken to all the people who participated in this tournament, which was under a cloud. There was Kurajica, there was Rashkovsky, Azmaiparashvili and someone else. But is not the point. Each had his own explanation. But the worst intentions were those of Zurab, because he wanted to stand out among equals and reach the elite by these means. But people change, perhaps, he became better. For example, with Rashkovsky we were certainly not friends, but time has passed, and now we have become veterans, I get along well with him. We have changed, have become not so aggressive. 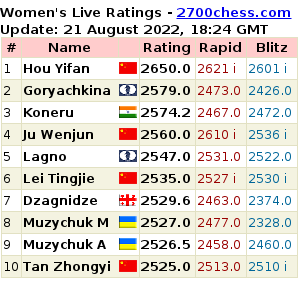 Now Azmaiparashvili occupies such a responsible position, he must repent before the chess world. For example, I will forgive him if he really appreciated what he did wrong. You know, maybe it will be thought wrong, but once in my life, I bought a point. That's how it is! But OK. I have talked about this to my pupils, and said that everyone has a choice in life, and you have to make a decision. That day I made the decision, and then I was at the mercy of fate I was punished. I think that the main thing that I did in chess - it's not the Sicilian and Sicilian lines with 2.c3 and 5...e5, no. I have enumerated the opening principles. I listed the eight principles - for four White and four for Black. You can read about them in any of my books. В Нинбо в эти минуты еще продолжается одна партия восьмого тура командного чемпионата мира, но основные результаты уже известны. Россия, наконец, выиграла все свои выигранные позиции и разгромила Израиль 4-0. Однако ничья в матче сборных Армении и Азербайджана означает, что претендентов на золото осталось только три: Армения, Украина и Китай. Российская команда в лучшем случае может претендовать на тройку.